Back in October Kirchoff's Jeff Kane said at a city planning commission meeting that the allotted space for the market was "undefined" because the market was assessing its needs. And there was some discussion about the possibility of another tenant occupying the retail space. The inclusion of the farmers' market had been one of the main selling points for this latest attempt to redevelop 1 Monument Square. The original plan, pitched back in February of 2014, included 20,000 square feet of space for the farmers' market in one of two proposed buildings. As the plan evolved, the space for the market shrank -- to 17,500 square feet in September of 2014, and then to 9,872 square feet this past summer as the project became one building. It'll be interesting to see how this new affects the arc of this situation. The current plan is facing organized opposition from a group calling itself We Care About the Square -- it's argued the plan differs too much from the original idea used to win the city's request for proposal process, and it's threatened to sue if the project isn't re-bid. 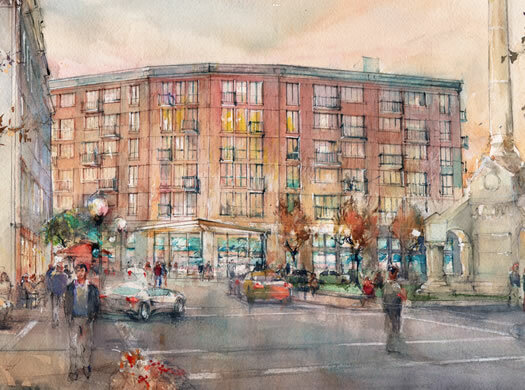 As of the end of this past October, the proposed development included one building with 75-80 residential units, 84 parking spaces on ground level, and street-level restaurant and retail space. The cost was projected to be $24.3 million. Dear Estee Lauder, Please express 1 case of lipstick to the City of Troy, because this project is turning into one big pig. Let's just put the new City Council Chambers there, right on the ground floor. That way Troy residents can walk right in and kick their Councilmember right in the behind on their way to work each morning. Maybe they can grab a tomato or delicata squash from the Farmer's Market on the weekends to huck their way too. Remind me again how we're revitalizing Troy, where everyone wants to relocate, by offering huge decades-long tax breaks to corporations when the City is broke? To say nothing of the potential plan to raise property taxes by 10% on the people who already live there. How stupid is the IDA or better yet, how corrupt? 12 Million dollar aid package... If this isn't voted down, somebody's going to prison. Because there has to be pay-outs involved here. My question is: was it ever the intention of the farmer's market to operate its proposed space in this building throughout the week? If not, it seems a waste of potentially really desirable real estate if it was only going to be used for a few hours each Saturday. I like the farmer's market very much, but getting a full-time grocery store back downtown seems like a more significant goal if we really want to make Troy a self-sustaining, walkable community.